We have many locations in the Las Vegas area. You don’t have to travel far to find a store location nearest you. Our Rainbow Boulevard store is located very conveniently, just off the State Road 95, just west of the North Las Vegas Airport! Just head north on State Road 95; take the east exit onto Lake Mead Boulevard, and turn left to head north on Rainbow Boulevard. You will see it on the left side of the road. 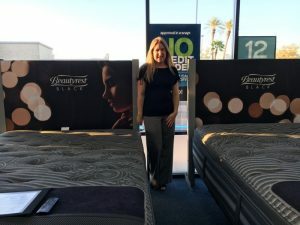 In this Las Vegas mattress store, you can take your time, try out as many mattresses you like, and ask any questions you might have. Our staff members are trained and well-educated to understand the content and function of each of our excellent mattresses. In the unlikely situation that we don’t know the answers you need, we will quickly find them, so that you can shop with knowledge and confidence. We are one of the largest mattress chains in the Las Vegas area, and as such are well equipped and well stocked to provide what you seek. We offer a wide range of mattress brands and styles, and can usually deliver your mattress right to your door the same day you buy! We will come and remove your old mattress and set the new one up for you, so you can begin to enjoy the benefits of your new mattress right away. Our products include: Serta, Beautyrest, Tempur-Pedic, and accessories, including pillows, mattress toppers and mattress protectors. Our address is 2303 N Rainbow Boulevard. You can call us at (702) 655-6086. We are eager to talk with you and help you find the best mattress you’ve ever had. Shona has a natural passion to help. She is a sleep expert with knowledge on Serta, Beautyrest, Tempur-Pedic, & Five-Star brands. She knows all the details about BeautyRest Black, Silver or Platinum! Serta’s Perfect Sleeper & iComfort definitely fall within her expertise. She can pair any brand with the adjustable base of your dreams at a low price with all the protective accessories that make your sleep the best!